This page tells the site's story. It tells the story of the commemoration of terror casualties in Israel of recent years and the reason this site was built. On Wednesday, March 5th 2003, five high school students left their school, Ort "Chana Senesh" in Haifa after yet another school day. The group included 3 girls and two boys who walked toward the nearby bus station. They aimed at bus 37 which would take them home. When they approached the bus stop they saw two number 37 buses, the first one was packed with students from the nearby "Wizo" school, because that day the "Wizo" students were released earlier than usual. The group turned to the second bus. One of the boys stepped onto the bus and saw someone he had fought with recently and didn't want to meet that day. He turned around and stepped off the bus. "I will take another bus" he said to the group and went off. The girls on the bus debated where to stop for lunch, they considered two places and finally chose the Carmel center. They started to get off the bus, they asked Asaf, the second boy in the group, if he wanted to join them. Asaf replied that he was tired and would rather go home and rest. Ortal, Asaf's girlfriend, kissed him goodbye and he promised to call her later. The girls got off the bus. Asaf called his friend Daniel and asked him what was planned for later. They chatted for a minute, Asaf promised to call later. Just another normal teenager making a casual call to a friend. A few minutes later at 2:12:32 pm and after the bus had passed two more stops, the number 37 exploded. The blast was heard all over the Carmel area. Asaf , almost 17 years old, was killed on the spot. Asaf is my son and ever since that moment our life has changed completely. After the seven days of mourning we were left alone thinking what tomorrow would bring and how one continues. One thing was clear, we must commemorate Asaf so that generations to come can learn about him, know him and can say "we know that boy." The first thing we did was to design the tombstone on Asaf's grave, since his favorite hobby in the last couple of years was wave surfing and since so many of his future plans involved surfing we decided to make his tombstone in the shape of the sea waves over a surfing board. This will symbolize his love for surfing and will be a commemoration that will teach something about him to the next generations. 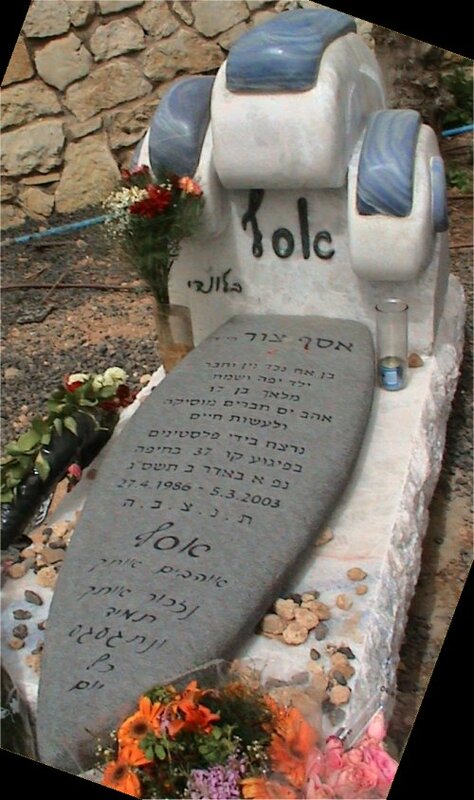 The tombstone is shaped as three waves breaking over a black stone surfing board, this way Asaf will be eternally surfing. This is how we will remember him and this is how we want everybody to remember him. To remember and never forget is the main motto of the site. While working on the site and designing the site, we considered appropriate names, finally the name "A People Remembers" was chosen. This symbolizes the unity of the people when it comes to remembrance of those fallen in Israel's continuous war for peaceful existence. The name also symbolizes the special relationship that exists between the families that lost their loved ones and who, instead of being angry and bitter, decide to contribute to the society around them by making a new commemoration site, a playground, a sport court, a computer room at a school or merely a statue that decorates the neighborhood. The family's donation to society is given in exchange for remembrance, a reasonable price for those who never experienced such a terrible loss and all they need to do is to remember. For the bereaved families the need for commemoration is irrepressible: After all what is left of our fallen children? The children hadn’t yet made their mark in this world, hadn’t invented things or made significant achievements to humanity, some hadn’t yet decided what to be when they grew up. They had barely started living. The commemoration at the place of the attack, in schools, playgrounds, in the streets, on the internet, in synagogues and in many other places allows people who never met the fallen to know something about them and more importantly to remember them. Commemoration comes in various ways. Each individual commemorates in his own way for his own purpose. Commemoration is chosen by the family and friends, the state's obligation is to allow and enable the commemoration, to encourage commemoration and to acknowledge the educational value to the future of all the people in Israel. In ten or twenty years there will be people walking the streets, waiting for buses, sitting near a memorial and the names of the fallen people will be burned in their memory. In this way our children will be known to generations of people that may have not yet been born. The commemoration enables the family to remember but also to analyze the loved one that is no longer with his family, to recognize what he loved, what represents him the best, how would he commemorate himself? The family has the opportunity to ask "What If?" What might he or she have done had they lived? The whole process gives the family the option to find new angles that are not revealed during the normal course of life and are discovered only after one is gone. This keeps the fallen alive within the family. What is commemoration? How does one explain commemoration? Sometimes a picture is worth a thousand words! While surfing the internet I found a painting that best explains the term commemoration. In the painting you can see a mother and her daughter sitting near the memorial wall for the Vietnam War fallen in Washington DC. The mother and child press their hands to the wall. The reflection in the wall is not of the two. The reflection shows the father and husband in Vietnam, the father also pressing his hand to the wall. On one side, Washington and its clear blue sky, on the other side dark skies, clouds, smoke and fire. From the infinite distance of life and death the mother and child touch and feel their loved one. The memorial wall closes the infinite distance of remembering and forgetting. This picture explains what commemoration is and its importance, when we lean our hand on a memorial wall or a monument we feel our loved one on the other side. The fine thread that goes from the fallen to those left behind stays connected only because the soul stays alive and only because we remember. Only those who lost a loved one know that the touch on this side of the monument is answered from the other side, only we know that our loved ones stay alive as long as they are remembered. The famous writer Gabriel Garcia Marquez wrote when referring to natural death, "Death doesn't come with old age. Death comes when one is no longer remembered". Commemoration serves to remind people and to avoid forgetting. Commemoration enables us to avoid the finalization of death. There are different types of commemoration. State commemoration, for example as in the central site at Mount Hertzel in Jerusalem, There is also public municipal commemoration, for example a central site in a garden of a city. And of course there is the private commemoration, for example a family that wants to call a playground or a sport court after its loved one. Private commemoration is divided into two main types, active and passive. Active commemoration is building a playground or a sport court or a computer room or a library while passive commemoration is building a statue that can only be seen and has artistic value to the people looking at it. State or municipal commemoration deals with events of public nature where the society as a whole feels the need to commemorate. Private commemoration is usually for a single person and is initiated by family and friends. Another meaningful difference is that state and municipal commemoration is funded by the state and the municipal authority, the private commemoration is paid by the family. It is a visible fact that families invest much more funds into commemoration than the state and the municipality do. State and municipal commemorations are simple and cheap while the private commemorations are modern projects costing hundreds of thousands of Shekels. When commemoration of a tragic event or attack is in question, the place of the event or the attack has a major significance to the family. The place where their loved ones were killed is sacred, there the soul was separated from the body, that place is usually commemorated and yearly ceremonies take place. Generations of Israelis were educated with the help of monuments like the armored vehicles on the road to Jerusalem. In the last few years, the state has educated its youth by sending school classes to the camps in Poland as part of the Holocaust studies. Whenever the Polish issue a statement about their wishes to decrease the size of the remaining camps and turn them into something else, there's a public protest. The DOD understood the importance of marking the site of special events and is conducting field trips for young soldiers, taking them to places where famous battles were fought. In a similar way, places inside the cities, where tens of people were killed, must be marked and commemorated so that future generations can come to the place, to seclude oneself and to remember. In many cities there are central commemoration sites but still in many others there are no such sites. It is easier to build a monument in the rural areas where people do not live, where there is no interference and where no municipal approvals are needed. Yet even inside the city it's possible to build impressive sites that will add to the city landscape to the city dignity and to the city heritage. The urban landscape dictates conditions with which the experts must deal, however, based on the monuments that exist today in cities it appears it is not impossible to build a monument or a memorial that blends into the urban landscape and provides both a dignified memorial to the families of the fallen and a respectful artistic piece to the near by inhabitants. When looking at memorials we need to look beyond the borders of Israel and see types of commemoration in other countries and civilizations. Jews do not create statues in the image of man, it is considered idol worship. However, we can learn a lot from people that have a rich heritage of commemoration. No one who visits Washington DC can ignore the memorial sites for the Korea and Vietnam wars memorials. Everyone who walks the streets of any European city passing by the statues, monuments and land marks which are scattered in every park and on every street corner feels the culture and the respect that the city and its inhabitants give to the commemorated ones, the respect to the city history. The value of commemoration was recognized ever since the very beginning of the state of Israel, people understood that remembrance has strength, the strength of a people who wants to win. In Hebrew the words forever (ìðöç) and victory (ìðöç) have the same root as if they mean the same thing. Many commemoration sites start as a place of pain but as time goes by they turn from a place of pain to a place of pride and strength. What vision it took to leave those armored vehicles at the roadside as a monument to the battles and men who broke the siege on Jerusalem! There's no way to commemorate in hiding, commemoration must be seen. Only by bringing the commemoration to the people, will remembrance happen. The people will be able to ask questions and know more about the commemorated. We do not build victory gates and have no hall of heroes. Only we know that wars, even if won, are a long journey into pain and bereavement. This land knew great suffering in wars and in between wars, its faces are carved with wrinkles of pain. We paid and still pay a high price for our right to be here, to build our life here. And how do we repay this wonderful large group of boys and girls that paid the ultimate price for our existence here? There's no retaliation. The little, we, the living, can give to our dead friends is memory, memories that go with us, that go after them. The wooden, metal and stone monuments are one of the ways, chosen by the state of Israel, the families and friends of the fallen in order to express our thanks and honor and commemorate them. The monuments are the land marks, the historic and geographic map of the wars, military operations and tragic accidents. They do not leave out any of the security events that are now an integral part of the life of this state. Nor do they ignore any place in this land, from the Mount Hermon in the north to the Eilat bay in the south. This land's story is carved into the wooden, stone and metal monuments. People of this agonized state stop near the monuments and ask, a lot of strength exists in those questions, in the curiosity to know, to learn and remember. The memory that is carved into the monuments travels with us from one battle site to another, from war to war like a relay race that covers the whole state and passes the stick of battles from one man to another. This is the historical conservation of the memory, of those "brave silent hearts", as the Poet Natan Alterman said. Yitzhak Rabin, Minister of defense. When I first started studying the issue of commemoration I found that there's nothing more hidden than commemoration, people pass a monument many times and do not know that it exists. Some monuments were built in the places where people were killed in rural areas or fields where access is difficult. I also discovered that there's no official or non-official body in Israel that documents the terror casualties' commemoration, this is also why many of those places are hidden and not known to the public. At the DOD there's a department called "The department for commemorating the soldier", that department deals with all commemoration tasks, this department issued the book mentioned above and does much more. Unfortunately there's no equivalent civilian entity. The research which discovered the places documented in this web site was long and started in talks with people I met at random, I gathered one site and another and another till the list was long enough to fill a book. Reaching the sites themselves wasn't easy as well. A monument in the city is easy to find if you have an address, it was interesting to find that people living near a monument do not know it exists, a monument at the fields or orchards of a kibbutz is even more difficult to find. It took many trips to the various parts of Israel till I found and photographed all the commemoration sites I collected. Many good people helped with information and guidance to the sites. I started the journey looking for Terror casualties monuments, during the journey I found that many that are not classified as terror casualties, such as soldiers were killed in terror attacks inside and outside of the cities and are commemorated at many places. This site therefore is most liberal in the artificial legal definitions of fallen soldiers or civilians and puts the main emphasis on the commemoration sites themselves. During my journey I found monuments that commemorate people fallen in terror attacks outside of Israel. Sites commemorating the Munich Olympic Games killed athletes, the workers of the Buenos Aires embassy and others. Here also the site is liberal and is not limited to attacks in Israel only. The research showed that there is a big variety of commemorations. Synagogues, Torah books, Sidur books, computers rooms, libraries, memory books, songs, discs, movies, funds and many more. The site concentrates at this stage in landscape commemoration, monuments that are placed outside in public areas. However, I came across some commemorations that I found impressive and important and in order to show those as well they were included in the web site. In many cases the two forms exist, both a monument and a book for example. Throughout the site, if there is a plate on the monument or near it with text, this explanatory plate stating who is commemorated and what were the circumstances that caused it are brought in a large picture. There's no way to be impressed by a commemoration site without reading the text that the family and friends decided to put there. Unfortunately most of those texts are in Hebrew. Every picture has a caption and the most interesting plate's text will be translated in the caption. This site brings the commemoration sites in honor of the fallen people and in order to show those who haven't made the journey with me the strong need to commemorate and to remember. Some of the description texts and captions may contain errors, I may have not found a commemoration site that is out there, I hope that families that will visit the site will contact me through the site's contact link and will update me so I can fix all that needs fixing. This site is not the end of the road, this project will continue for many years, even now I have a list of a few dozens of sites I need to find and visit, photograph and add to the site. The work will be done as time permits. The research started by asking people at random, I found people that I thought might have such information, later I publicized an ad in the "terror casualties organization paper" and was disappointed by the low number of responses I got. After some weeks of research and after accumulating enough places, I left my work, took a six-month leave of absence and started going to find those sites and document them. The process of finding the places that are far in fields or orchards was very interesting, challenging and sometimes disappointing. I learnt that you need to get to the Kibbutz or settlement office early and not during lunch time. I would ask about the commemoration site I was looking for, and then one of the elders was called to help. On many occasions he would accompany me in person to the place, when he didn’t accompany me I used to walk the fields, sometimes for hours till I found the monument. Many times I would pass it and wouldn’t see it, sometimes it was hiding behind bushes that I had to tear down in order to be able to photograph it. In many places I could see that I was the first to visit the place after many years. Sometimes I had to bring some cloth and water and clean the monument so it will be worth photographing. At the beginning I contacted Erez Shani from the Jerusalem municipality, he accompanied me for a tour of central Jerusalem and showed me many places that the city commemorated. After this tour I was convinced that there are many commemoration sites in Israel and that they need to be discovered. The project got a big article in the Maariv daily newspaper, written by Tali Lipkin Shahak, the story about the project led to some more attention and people called me to tell me about sites they know. I met with Dr. Ilana Shamir who wrote the book "Monument" that was issued by the DOD and which is mentioned earlier in this page. I got a few tips from her and continued on. I later met with Eitan Israeli who made a survey of commemoration sites all over the upper Galilee area. His was a survey of all monuments, I learnt from him about quite a few new places. I then became well known and I no longer needed to call people and ask around, people would call me and tell about commemoration places in Israel. The Israeli people are united in face of danger and commemoration. The same way we saw in the Second Lebanon War soldiers from former Gaza strip and from Judea and Samaria fight and fall with soldiers from the left side of the political map, we see it also when commemoration is in question. During the research and the attempt to get more and more places I met two people that helped me a lot and gave me many pictures of commemoration sites, both sent me pictures from Judea and Samaria, a place I don’t know and didn’t get into for personal security reasons. Those two travel there a lot as part of their tasks and whenever they see a commemoration site they stop and photograph it. Since most of the sites in Judea and Samaria are spontaneous sites they appear suddenly and are not publicized. Those two can’t be farther away from each other in their view of life and politics. The first is Rami Landau from the Judea and Samaria internet news site who travels a lot in that area and always with his camera on him. The other from the far left wing is Dror Etkes of the Peace Now organization who travels to document and picture the settlements in the west bank. They can't be farther away in their views but also can’t pass a commemoration site and not take its picture in order to document it. They sent me many pictures and sometimes of the same place, the different angle, time of day and lighting gave me more variety of the pictures. During my trips I saw many monuments, a couple captured my attention and made an impression that I can’t forget. The first one is the monument in memory of those fallen in Beit Leed in the double attack. This monument is still being built and should be completed in the near future. 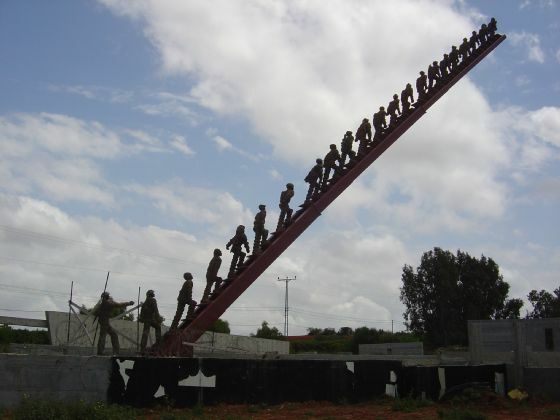 Everyone driving on the road from Kefar Yoanh to Natania can't miss that Huge ladder pointing at the sky and the 22 figures climbing it to the sky. For many years this monument was not completed showing the hardship those families had to go through in order to commemorate their loved ones. The second one is the bus station in Mexico Street in Kiriayt Menachem in Jerusalem. Near that bus stop was an attack on a city bus and the families decided to keep the bus station as a living monument. Every piece of paper covered with plastic, every flower fresh and when one looks at the bus station it is noticeable that the only material used to create this commemoration is love. This is a wonderful monument since every person that passes in the street can stop look and read about the fallen ones and remember them forever. The material gathered in this site was the source for papers written by students that research commemoration, those papers were both about the shapes of the monuments as well as the writing on the plates. I hope that this site will encourage more commemoration and will be beneficial to all those that want to learn about commemoration in Israel. 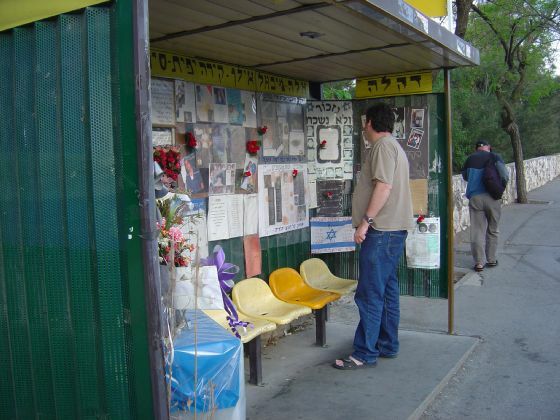 Asaf was almost seventeen years old when killed on bus 37 in Haifa on March 5th 2003.